Farhan and Shibani are often spotted together. 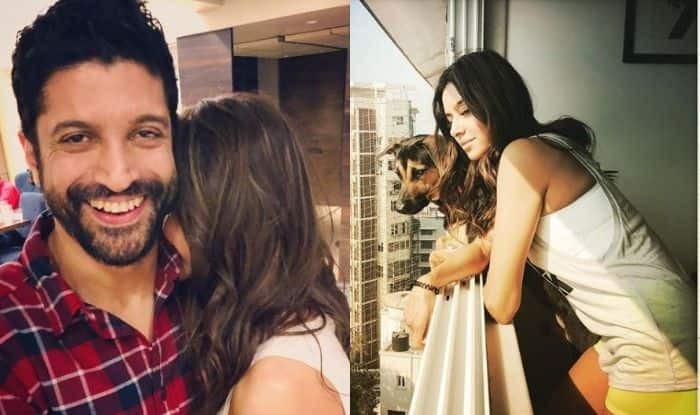 Farhan Akhtar and Shibani Dandekar are rumoured to be dating for quite some time and it seems like they are in no mood to hide anything. After their multiple joint appearances and social media PDA, we were sure that they are head over heels in love with each other. Now, the actor has taken a step ahead and almost confirmed his relationship with Shibani. He shared her picture with a dog and wrote a beautiful caption. Dressed in a yellow shorts and grey tank top, Shibani looked beautiful as she relaxed in the balcony. A couple of days back, both the stars were spotted together stepping out of a restaurant. They looked comfortable in front of shutterbugs and Farhan even waved to them. Both of them made their first public appearance at Sonam Kapoor’s wedding reception. Since then, people are waiting for them to make things official. Talking about it, Shibani revealed to Mid-Day, “I don’t need to make an announcement about who I’m dating. It’s up to me to decide when and what I want to share about my personal life and it is up to the audience to decide how they look at it. How much information I want to put out in the public domain is my prerogative”. On the professional front, Farhan is busy with the work of The Sky is Pink which also features Zaira Wasim and Priyanka Chopra.